From left, Larry Thornton of Gladstone, NJ, Matheny volunteer and past Grand Knight; Matheny president Steve Proctor; Bob Warren of Martinsville, immediate past Grand Knight; and John Arcoleo of Martinsville, newly elected Grand Knight. 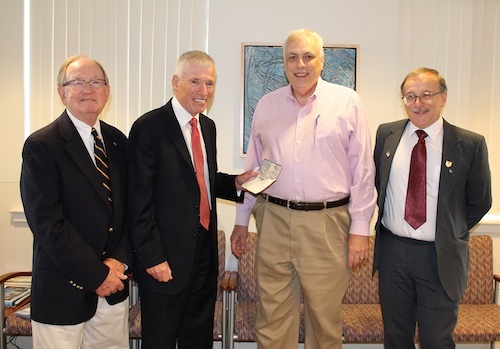 Members of Knights of Columbus Council 5959 at Blessed Sacrament Church in Martinsville, NJ, recently visited Matheny to deliver a donation of $720 and to invite Matheny president Steve Proctor to attend a future Knights meeting to talk about Matheny’s programs and services. The plan is to open the meeting to the community at large. Thanks to the Knights for their wonderful support of Matheny and for their efforts to spread the message about what we do to a wider audience! This entry was posted in Uncategorized and tagged Knights of Columbus. Bookmark the permalink.